Gathered on the top floor of the Hall building, a small group of students sat quietly among shelves of plants, carefully cutting, pasting and glittering a fresh batch of artistic booklets. 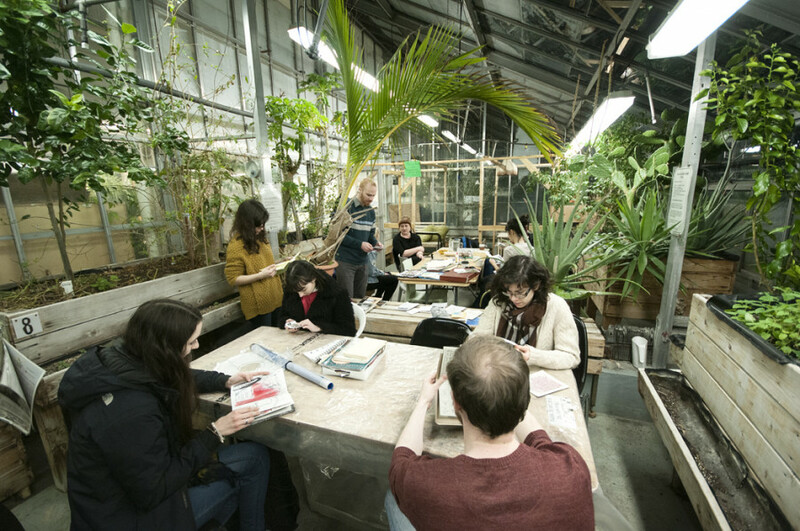 The crafters were participating in the Concordia Greenhouses’ monthly Art in the Atrium series, which kicked off the winter semester on Thursday evening with a zine theme. “It really allows an opportunity for sharing information, for chatting about people’s lives,” said event coordinator Sheena Swirlz. Complete with pumpkin cookies, tea and a temperature at least 30 degrees warmer than outside, the evening began with a quick briefing by Swirlz on different kinds of zines, where to find them, how to make your own and several examples. Defined by Swirlz as a small creative project that “you give yourself [as] a self-published book,” zines can be anything you make of them. From small zines about different kind of screws to medium ones about little blue houses, to ones with wax paper covers displaying a collection of short stories, the crafters were never far from inspiration. With some choosing to make collage zines out of old books, and others preferring to make use of the old-fashioned stamps Swirlz provided, the evening concluded with a fresh batch of zines ready to be distributed. These small booklets can be kept for oneself or circulated widely as a travelling zine, which is passed along from traveller to traveller until it becomes a completed publication. “The best thing to do is to go to a workshop like this and get interactive,” said Swirlz. Montreal is a hub for zine culture. Annual events such as Expozine, the Anarchist Bookfair and the Queer Book Fair are venues that provide an outlet for prospective zine-creators. Local zines can be found on the shelves at the Concordia Co-Op Bookstore. Closer to home, the Greenhouse shelves some on herbal health. The monthly “crafternoons,” which are set to continue for the rest of the semester, have a short but rich history. “It was started about two years ago by volunteers, and it has continued as a regular event, partially because this is a really great space to make art and also because there’s not a lot of creative play events on campus,” said Swirlz. Previous months’ themes include making new candles by recycling old wax; creating bird boxes, miniature stuffed animals and terrarium necklaces; and wood burning. “You could just make somebody a little zine about the top ten things you like about them,” Swirlz added. Beyond Art in the Atrium, the Greenhouse regularly hosts a variety of events such as weekly educational workshops, music parties, clothing swaps and film screenings. The Greenhouse also hosted their annual plant sale last Wednesday, which saw over 700 plants sell out within an hour. To see when the next Greenhouse event is, checkout concordiagreenhouse.com or their Facebook page.